Platform shoes are definitely back this season, and this lovely pair from Russell & Bromley have all the elements you need to make a fashion statement. 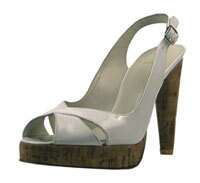 For the full 70s inspired look, this Ex Sling pair in white patent leather have platforms made from cork. If that doesn’t have you dancing round your handbag in a Saturday Night Fever stylee I don’t know what will. If you don’t like white they also come in a slightly more practical black and are available at a Russell & Bromley store near you. You can find out more on their website.